This interdisciplinary journal addresses issues relating to human interactions with the natural world over time, and includes insights from history, geography, anthropology, the natural sciences, and many other disciplines. This past December, millions of people around the world gazed in wonder at the rising of the so-called “super moon.” The moon looks super when it turns full on its closest approach to Earth, and variations in its orbit brought it nearer to us than it has been in almost 70 years. Yet even this extra super moon was scarcely bigger than a regular full moon, and few would have noticed the difference without breathless media reports that encouraged them to see it. Those who looked up in awe certainly responded to a genuine natural event, but their culture also conditioned how they understood that event. Similar relationships have played out before, in ways that have had profound consequences for human history. For centuries, historians argued about which people, or groups of people, have been most responsible for shaping the course of human history. They rarely considered the shifting stage on which the human story plays out: the natural world. 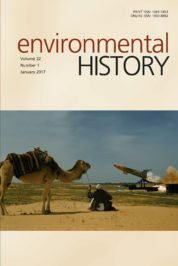 Then, in the 1960s, environmentalist historians pioneered a new kind of history – an “environmental history” – that traces how nature has shaped, and been shaped by, human beings. To explain the course of human history, they argued, we must look not only at human actors but also at a cast of decidedly nonhuman characters, from soils and pathogens to oceanic and atmospheric circulations. Environmental historians have focused on Earthly environments, and with some justification: the Earth is, of course, the ancient cradle of humanity. Yet our world cannot be so easily distinguished from the much bigger environment beyond its atmosphere, and as the super moon makes clear, parts of that bigger environment can affect us on Earth. Some of those connections are more obvious than others. Long before humans strengthened the greenhouse effect, for example, changes in Earth’s orbit around the sun caused our climate to fluctuate in ways that shaped our prehistory. The moon has also had a profound impact on the human past, owing not only to its appearance but also its gravitational pull, which causes tides that shaped the fates of coastal communities. Surprisingly, even changes in environments on distant planets have occasionally had dramatic consequences for human beings on Earth. Take, for example, the natural and cultural drama that accompanied the death of a comet in Jupiter’s atmosphere, in 1994. Early in the twentieth century, Jupiter’s immense gravity pulled that comet into an erratic orbit around the planet. In 1992, the comet passed so close to Jupiter that it was ripped apart by tidal forces. The fragments and dust released by the breakup were together much brighter than the nucleus had been. As they passed out of Jupiter’s glare, they were suddenly easy to spot from Earth. Deep bruises on Jupiter during Impact Week. Brown spots mark impact sites on Jupiter’s southern hemisphere. Image by Hubble Space Telescope Comet Team and NASA. Public domain via Wikimedia Commons. In March 1993, a group of amateur astronomers led by David Levy and partners Carolyn and Eugene Shoemaker spotted a strange smudge near Jupiter. They soon recognized that they had discovered a new comet and called it “Shoemaker-Levy 9,” since it was the ninth they had found together. The circumstances that led observers on Earth to scan the heavens just as a comet disintegrated and brightened near Jupiter had a deep intellectual and cultural context. Nineteenth century astronomers had gradually realized that comets and asteroids travelled in huge numbers through the solar system. Twentieth century scientists then found that these objects occasionally crashed into planets, with catastrophic consequences. Meanwhile, popular ideas in western societies that favoured probability and change replaced those that privileged stability and continuity. Cultural and scientific developments together led to a new and precarious vision of humanity’s place in the cosmos. That vision encouraged astronomers to hunt for changes in the cosmos, and it would provoke dramatic popular responses to the changes they discovered. 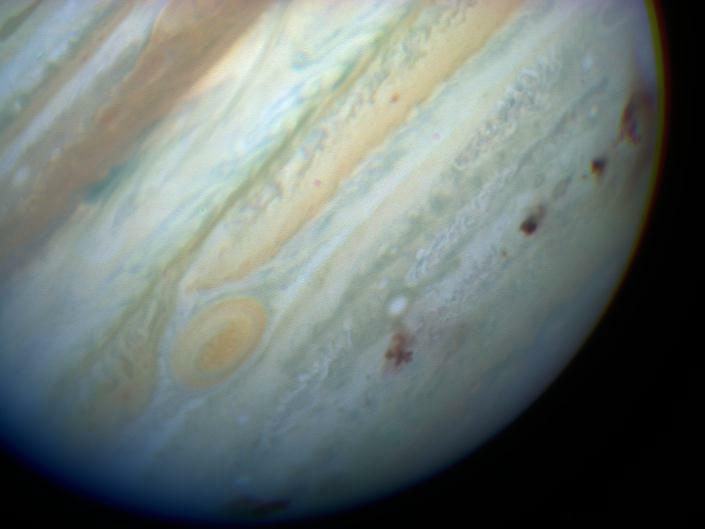 In May 1993, astronomer Brian Marsden astonished the scientific community by predicting that the comet’s fragments would crash into Jupiter in the following year. It would be the first collision ever observed between known bodies in the solar system. The looming impacts quickly led to unprecedented changes in the culture and practice of astronomy on Earth. Major scientific bodies in the United States coordinated their funding allocations for the first time, and quickly awarded more than two million dollars (adjusted for inflation) to efforts at observing the collisions. Television, radio, and newspaper journalists both encouraged and responded to rising popular interest. In July 1994, “Impact Week,” as journalists called it, finally arrived. Most scientists had predicted that the impacts would disappoint the general public. They were startled when brilliant fireballs left Earth-sized bruises on the giant planet. Live television broadcasts captured the jarring violence of one cometary fragment after another colliding with Jupiter. These broadcasts were supplemented by a revolutionary new medium: the Internet. NASA officials had earlier decided to use the Internet to publish real-time images of the collisions. They were astonished when over 2.5 million Internet users accessed these images during Impact Week alone. It was the world’s first major web event. Even for the offline majority, the collisions raised popular interest in the early Internet. Subsequently, NASA officials prioritized their online services over investments in more experimental technologies. 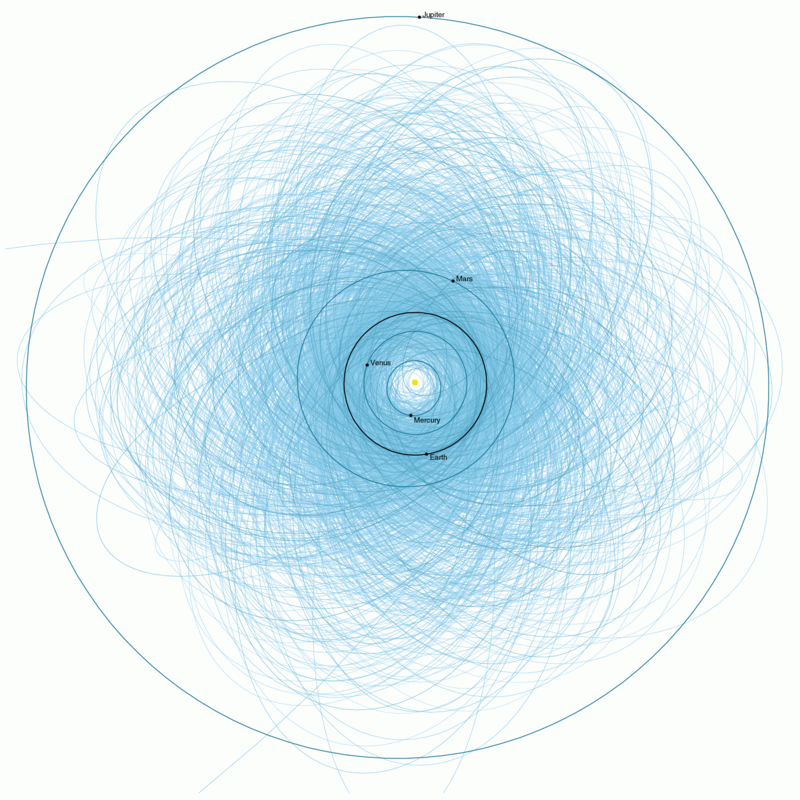 A map showing the orbits of Potentially Hazardous Asteroids at or above 140 meters in diameter, passing within 7.5 million kilometers of Earth’s orbit, discovered as of 2013. Jet Propulsion Laboratory, “Orbits of Potentially Hazardous Asteroids (PHAs).” Public domain via NASA. Millions of amateur astronomers also used modest telescopes or binoculars to spot the impact scars as they spread across Jupiter. The bruises humbled and frightened many who saw them. For the first time, politicians, journalists, and ordinary people seriously considered the possibility that a comet or asteroid might someday threaten Earth. In the following months and years, space agencies around the world responded to political pressure by launching or intensifying programs aimed at finding Earth-approaching comets and asteroids. If a threatening object is detected well before it reaches Earth, it can perhaps be deflected or destroyed. At the very least, the impact zone can be evacuated, although there is little point if the asteroid or comet is big enough. The renewed quest to defend Earth has led to a detailed map of the space near our planet. That has revealed many thousands of little rocky bodies, none of which will hit Earth any time soon. Most are, however, within reach of unmanned and, before long, manned spacecraft. Companies such as Planetary Resources have recently raised billions of dollars to fund robotic missions that could soon mine these asteroids. Their proponents argue that outsourcing mining to space will support humanity’s colonization of the solar system while reducing its environmental footprint on Earth. Strangely, comet impacts on Jupiter, by galvanizing support on Earth for efforts to scan our corner of the solar system, may soon let companies exploit the environments of nearby asteroids. The Shoemaker-Levy 9 collisions, like the furor over the recent super moon, reveal that environmental changes in space can affect popular culture on Earth. The collisions, however, also show the extent to which these changes can influence our politics and economy. As we gaze ever deeper into the cosmos, and especially as we begin to colonize it, we will open ourselves to the dynamic influence of ever more distant, and more alien, environments. Featured image: The shattered comet, a so-called “string of pearls.” Shoemaker-Levy 9 on 1994-05-17 by NASA, ESA, and H. Weaver and E. Smith via the Hubble Space Telescope. Public Domain via Wikimedia Commons. Dagomar Degroot is an assistant professor of environmental history at Georgetown University. He bridges the sciences and humanities to reconstruct extreme environmental changes and trace their human consequences. He founded and directs HistoricalClimatology.com, a popular website, and he co-founded and co-directs the Climate History Network, an organization of more than 200 climate scholars. Dagomar is also the author of “‘A catastrophe happening in front of our very eyes:’ The Environmental History of a Comet Crash on Jupiter,” recently published in Environmental History. He is working on a book that explores the environmental history of the solar system. It would be interesting to explore the opportunity cost incurred when NASA prioritized PR over science. How much has NASA invested or geared policy toward popular interest and away from exploratory endeavors? Would we have been mining asteroids sooner or would commercialization have come any quicker? Thanks for the novel perspective. Seems we could use a reminder these days that our environment shapes not only who we are but those who will follow us. You are right: I looked at the Super Moon and couldn’t really tell the difference! Thanks for this interesting and informative piece. I remember the excitement about Shoemaker-Levy 9 impacting Jupiter at the time. It was a fascinating event, but it’s very interesting to trace the consequences on our society.